Your store visitors always have at least several questions related to products you sell. If these questions are left unanswered, you lose potential buyers and profit. So how to solve the problem? 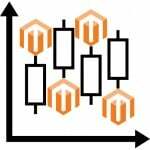 We recommend you to install one of Magento 2 FAQ modules. Below, we describe the MageDelight Product Questions & FAQ Magento 2 extension. This tool allows to create a knowledgebase of questions and answers, where visitors can find the desired information instantly. Below, we describe all key aspects of the module. Various visual effects and design customizations. The most brilliant feature of the MageDelight Product Questions & FAQ Magento 2 module is the ability to display questions and answers on a separate page as well as under a special tab on a product page. Thus, your visitors can rapidly find the answer without even leaving a product page that caused the question. As for social sharing, this feature of the MageDelight Product Questions & FAQ Magento 2 extension allows to post helpful questions and answers on social media services. Besides, there are like/dislike buttons available for each question. They help to find the most helpful answers. If a question is not available on a product page, a customer can use a search field to find the desired answer. As mentioned above, it is possible to use both keywords and tags to discover more information. 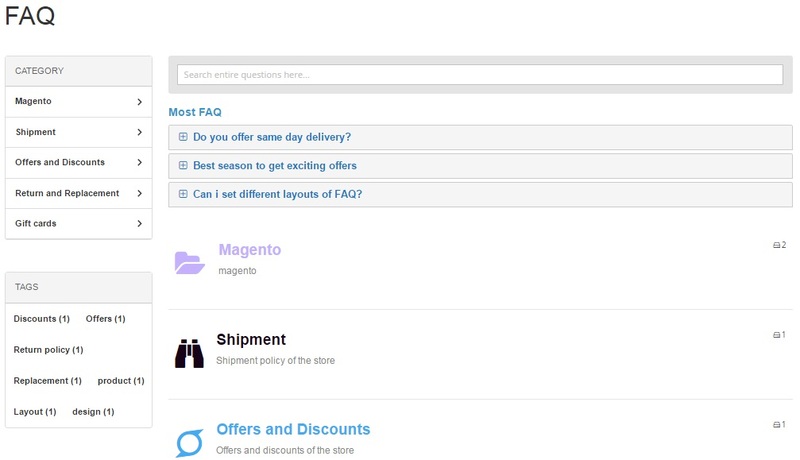 And it is possible to customize the design of the Magento 2 FAQ interface by changing fonts and colors. As mentioned above, there are also several layout types to chose from. 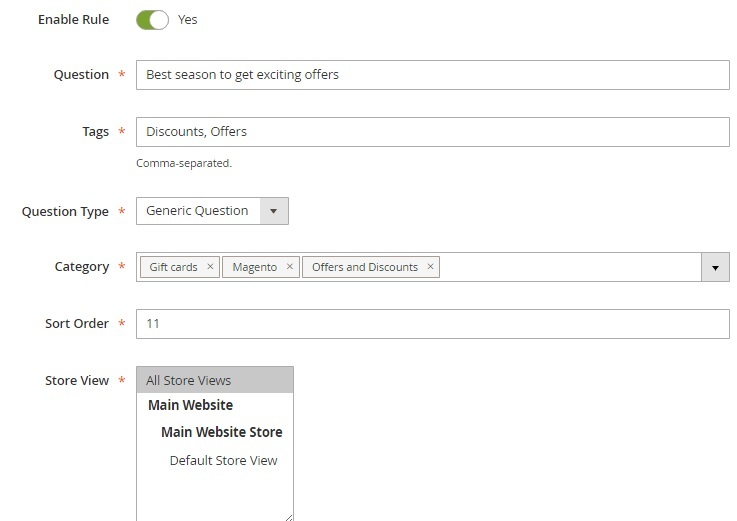 Besides, the MageDelight Product Questions & FAQ Magento 2 module allows to improve question display with animations and icons. 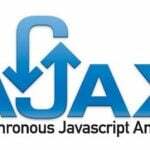 Below, you can find how these features are implemented on both backend and frontend. To configure the extension, go to Stores -> Settings -> Configuration -> MageDelight -> FAQ. The page is divided into 4 sections: License Configuration, General FAQ Configuration, Product QA Configuration, and Generic FAQ Configuration. 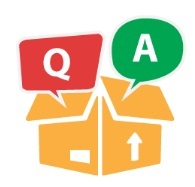 While the firs section requires only serial and activation keys to be specified, the General FAQ Configuration section allows to enable/disable the two core elements of the MageDelight Product Questions & FAQ Magento 2 module: Product QA and Generic FAQ. The first one is a tab with questions and answers on a product page, while the second one represents a separate page with FAQs. In Product QA Configuration, you can only enable the section for guests or unregistered customers. As for Generic FAQ configuration, it allows to make FAQ categories linkable, select the layout of the FAQ page (Category grid view, Category list view, Category and question list view, Category and question grid view), and enable/disable author information and social links. The other settings provide more deep customization: you can set titles for FAQ link and page, specify FAQ route name, create a custom URL key for the FAQ page, specify URL suffix for the FAQ page, and add meta keywords and description. 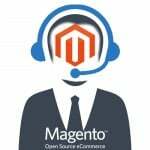 Now the MageDelight Product Questions & FAQ Magento 2 extension is configured. Let’s take a look at FAQ categories which are available in a grid. The grid displays category ID, title, URL key, store view, status, and time of creation and modification. While adding a new category, specify its title, URL key, and description. Next, select a layout and upload a category image. Specify Customer groups to display the category to, set its position, and select store views. Besides, you can configure category design, apply various SEO improvements, and add questions to the category. As for questions, they are available under Content -> FAQ -> Questions. The appropriate grid shows question ID, the question itself, its author, question type, status, and time of creation/modification. While adding a new question, type it, add tags, select a question type (Generic Question, Product Question, For Both), and specify categories. Next, set a sort order and select a store view. Then, use editor to create the answer. Also note that it is possible to set the amount of likes and dislikes as well as move the question to the most viewed block. 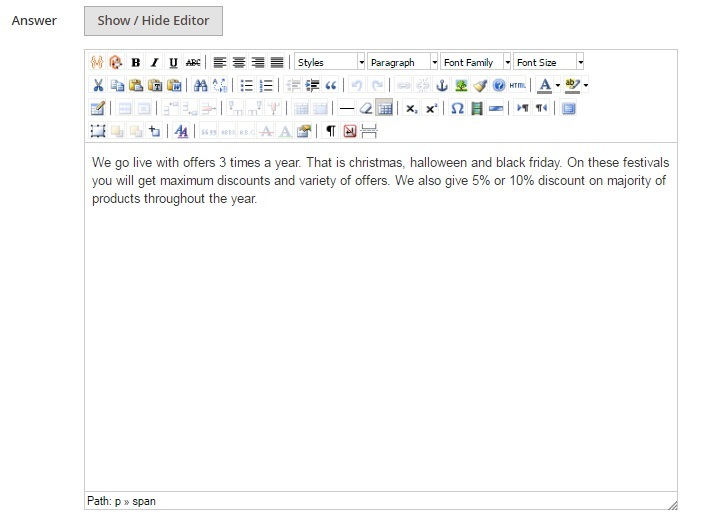 In Question Author, you can enable email notifications as well as specify author name and email. 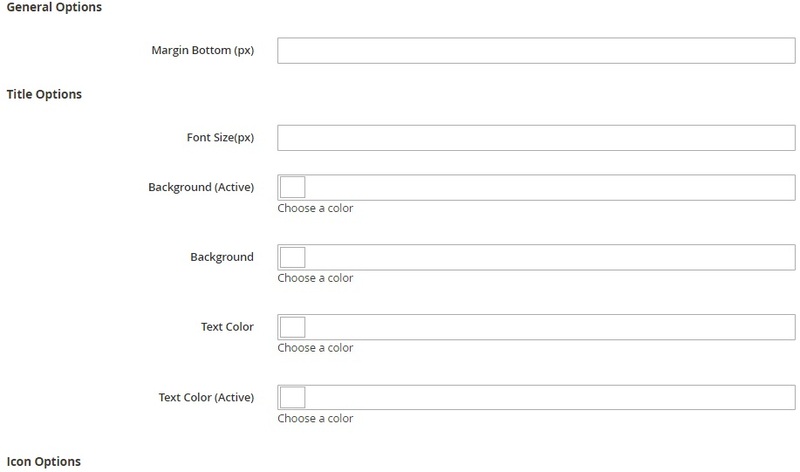 The design section allows to fully customize the frontend appearance of the answer section. As for Search Engine Optimization, it lets you specify page title, meta keywords, and meta description. 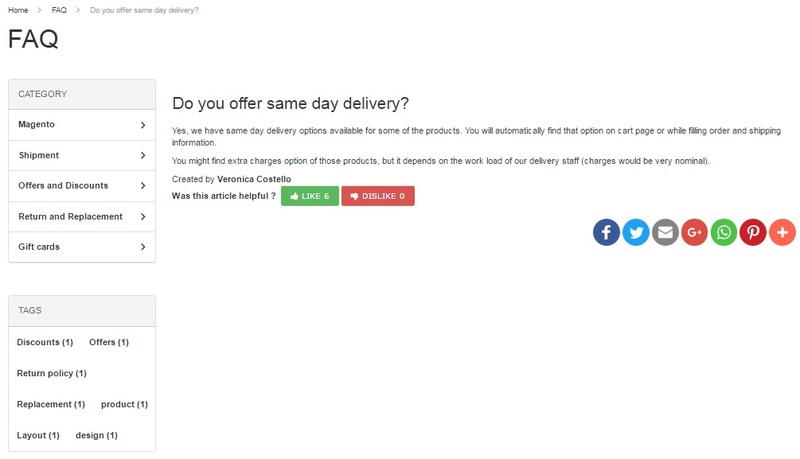 The Products In Question section allows to link the question with certain product pages. Alternatively, you can add questions and answers to product from the product information page. Open the Related Questions tab and hit the “Add Related Questio” button. It allows to select questions from the grid. You can add multiple questions in bulk. A question page has the following appearance. Note that in addition to question, answer, and like/dislike buttons, it includes blocks with categories and tags. The MageDelight Product Questions & FAQ Magento 2 extension offers an intuitive interface with additional information about products. 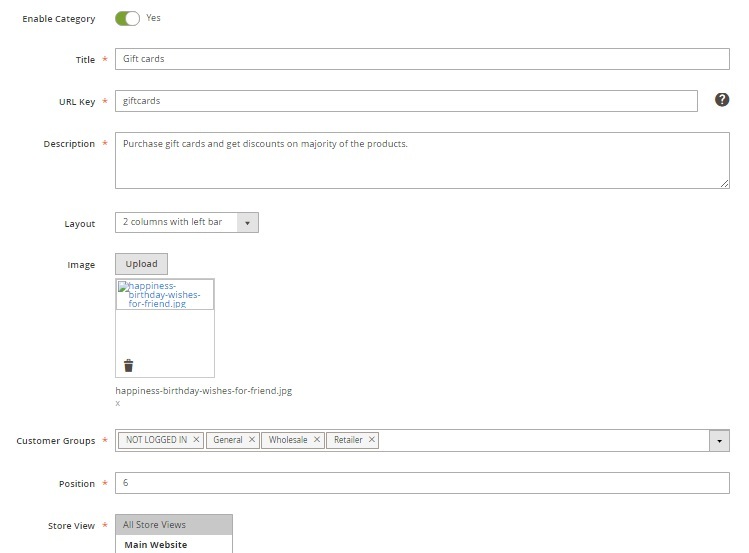 The improvement is available in a form of a separate page with questions and answers as well as can be represented in a tab on a product page. The price of the module is $199.